Leslie Pal (reference below) summarizes the tools and techniques for successful implementation proposed by Eggers and O’Leary. Task and milestone management: Set goals and timelines. Stakeholder management: Identify stakeholders and their needs and expectations. Change management: Develop a transition strategy to increase support. Risk mapping: Identify the probability of significant risks. Set up a war room: This is a sort of “command centre” to manage implementation. Scenario plan: Develop scenarios of how and why things might go wrong. Segment your customers: Divide the universe of potential “customers” into similar and more tractable groups. Chunk your projects: Try to break large projects and initiatives into more manageable “chunks” that are less complex and less risky. Eggers, W., & O’Leary, J. (2009). 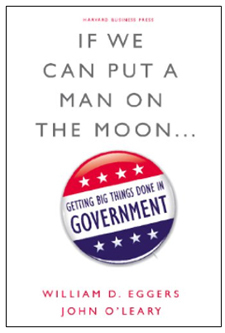 If we can put a man on the moon … Getting big things done in government. Boston, MA: Harvard Business Press. Image: From Amazon.ca cover of Eggers and O’Leary book at https://www.amazon.ca/dp/B005DI8XPS/ref=dp-kindle-redirect?_encoding=UTF8&btkr=1, accessed 6 April 2017.